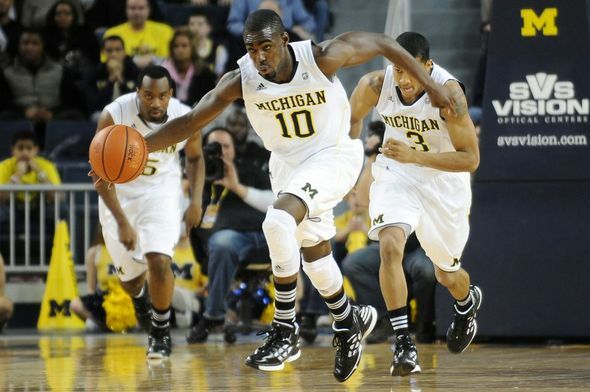 Posted on Sat, Dec 3, 2011 : 4:16 p.m.
Tim Hardaway Jr. (10) scored a team-high 19 points in a 76-66 win against Iowa State at Crisler Arena on Saturday. Earlier in the week, one decisive run cost the Michigan basketball team a victory. On Saturday, the Wolverines lived on the other side of the coin. Tim Hardaway Jr. finished with 19 points and six rebounds and No. 14 Michigan used runs of 13-2 and 16-2 to pull away from Iowa State, earning a 76-66 win in front of 10,845 at Crisler Arena. The win served as a bounce-back performance for Michigan (6-2), which was on the wrong side of a 15-0 run during a 70-58 loss at Virginia earlier in the week. "We weren't intense enough, we weren't hungry and we kind of played like we were scared (against Virginia)," Hardaway said. "We wanted to come out here and just prove to everybody that we're a tough-minded team and can bounce back from anything." The game served as a bounce back performance for Hardaway, who finished with just five points in the loss to the Cavaliers on Tuesday. Trey Burke, Eso Akunne and Blake McLimans all knocked down 3-pointers in a 13-2 run at the end of the first half that swung the game in Michigan's favor. The Wolverines then slammed the door with a 21-5 run to open the second half, stretching the lead to as many as 22 points. After a forgettable five-point performance in a 12-point loss at Virginia earlier in the week, Michigan sophomore guard Tim Hardaway Jr. bounced back and finished with 19 points, six rebounds and three assists. Chris Allen returned to the state of Michigan and it wasn't a positive experience. The former Michigan State guard finished with 11 points on 4-for-16 shooting. Minnesota transfer Royce White fared better for the Cyclones, finishing with 22 points and 13 rebounds. "We weren't intense enough, we weren't hungry and we kind of played like we were scared (against Virginia). We wanted to come out here and just prove to everybody that we're a tough-minded team and can bounce back from anything." Michigan freshman point guard Trey Burke ended his night with 13 points and three assists, while sophomore forward Jordan Morgan added 16 points on 7-for-10 shooting. Iowa State was paced by sophomore forward Royce White, who finished with 22 points and 13 rebounds. Former Michigan State guard Chris Allen, now a senior at Iowa State, scored 11 points on 4-for-16 shooting. The Wolverines found themselves in trouble late in the first after a bucket by White finished an 8-0 Iowa State run to put the Cyclones in front 23-21 with 4:26 to go in the half. Michigan would answer, though, as Eso Akunne began a 10-0 run with a 3-pointer 20 seconds later. Burke would cap the spurt with a triple of his own at the 1:45 mark before Blake McLimans would polish off a half-closing 13-2 run, giving the Wolverines a 34-25 edge at the break. "The bench was really responsible (for the first-half run)," Michigan coach John Beilein said. "Eso came in, and shots weren't falling for us. But he went behind a ball screen and knocked one down. "Blake got a pick and roll, took a charge and hit a 3 to end it." The rest of the day belonged to Michigan. The Wolverines stretched the lead to 15 after an Evan Smotrycz layup five minutes into the second half. Smotrycz's two free throws two minutes later pushed the lead to 20 before Stu Douglass found Morgan for a two-handed dunk, capping off a 16-2 run to give Michigan its largest lead of 55-33 with 12:41 to play. The latter part of the half wasn't as pretty for Michigan. Iowa State used a late 20-8 push to draw within six in the final 22 seconds. But it wasn't enough, as the Wolverines went 8-for-8 from the foul line in the final minute to close out the victory. "We've got to learn from (the second-half letdown)," Morgan said. "That's when we made a few mistakes. We've got to step up and take control of the game and just be solid." Michigan hit seven of its first eight shots to open the second half before finishing 14-for-24 after halftime. Entering the game, Iowa State was shooting 42 percent from 3-point range as a team. On Saturday, Michigan held the Cyclones to just 7-for-29 (24.1 percent) shooting from long range. "We'll play a lot of good 3-point shooting teams," Beilein said. "We won't play another that can get back in the game as fast as that team can." Michigan will now take a week off before playing Oakland in Auburn Hills on Dec. 10. It'll be the Wolverines' fourth game against the Golden Grizzlies -- who beat Tennessee at home this week -- in the past five seasons. Beilein's glad his group will extended time to prepare. "If you can beat them, you're beating a very good team," Beilein said.